Goldcrest House is a 16 bed residential care home based in Goole East Yorkshire. 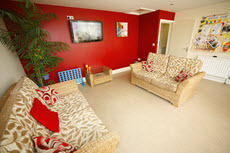 The home is a specialist service designed to meet the need of adults on the Autistic Spectrum. Situated on Boothferry Road, Goldcrest House provides residential care to adults over the age of 18 whose primary need is due to autism. We can also meet the needs of service users who have additional difficulties, including those with general developing disabilities and those with a history of behaviours that have challenged other services. Potential service users who do not have a diagnosis of autism but who would benefit from a living and developing environment that has been designed to cater for those with autism will also be considered for admission. We are registered with the NAS and will consider emergency admissions. The House provides long-term, integrated, specialist day and residential care, outreach support and respite care and has built a reputation as a quality service in the area. 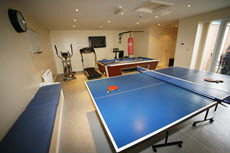 Our Gymnasium and relaxation area is a communal space for fun, relaxation and socialising. The leisure complex not only consists of cardiovascular gym equipment, including a rowing machine, cross trainer, treadmill, weights, punch bag and exercise bike, but benefits from leisure pursuits such as table tennis, pool and darts. Within the complex is a multi-sensory room, especially designed to offer a sensory experience with soothing lighting, sounds and textures proven to ease anxiety, encourage communication, and generally stimulate the senses. Goldcrest House has a full time Programme Facilitator whose role it is to facilitate a 9-5 activity and educational programme designed to meet each Service User’s personal needs. A typical week at Goldcrest House can see Service User’s taking part in baking or craft activities, swimming or football, educational courses at the local college, participating in work experience within the community, or taken part in cultural outings to museums or areas of interest. The Registered Manager of Goldcrest House, Trish Patrickson said: “Our long-term care plans are ultimately about enablement. Each individual is supported by a bespoke programme of development that ranges from addressing their right to vote or work, to learning and gaining a qualification, developing life skills such as managing money or going shopping, or physical health through exercise, we cater for every need. 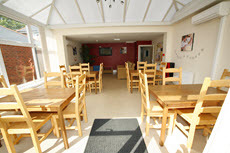 The kitchen is large, modern, well stocked and is a favourite place for both staff and service users. It is used by the Home’s baking activity co-ordinator who supports our service users learn how to create meals from scratch and bake delicious buns and cake – a favourite pastime here! 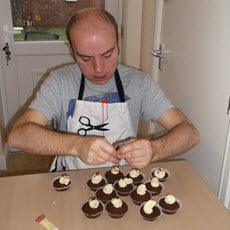 Pictured is Andrew a budding Great British Bake Off contestant, there’s never any waste when Andrew bakes. 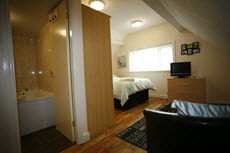 Naturally all our services users have their own room with ensuite bathroom. All bedrooms are furnished with tasteful and modern furniture with hi-specaccessories and gadgets. If you like what you see at Goldcrest House and think that you might like a place here for your service user please do not hesitate to call us on 01405 763607 for a confidential chat about your requirements.